In many ways Herbert Ewing was one of the ‘lucky’ ones. A volunteer in 1914, he spent a great deal of the war in India, was wounded in France, and survived the war still aged only 21. Herbert initially joined the 1st/5th Somerset Light Infantry (a Territorial Force battalion) as a 17 year old underage volunteer in September 1914. In October 1914 the battalion was sent to India as a replacement for British Regular troops who had been sent to the western front. Herbert spent just over a year in India, and the first two thirds of his diary cover this time in the form of individual diary entries for each day. Herbert’s descriptions paint a vivid picture of what life was like, from the conditions on the troopships to the endless drilling, marches, and shooting practice. A sense of boredom and a desire to see action come through strongly, and this led to Herbert applying for a commission. In November 1915 he was successful, and embarked on officer training back in Britain. This point onward is covered by the remaining one third of the diary, which differs in style in that it was compiled in the late-1960s during Herbert’s retirement. In September 1916, following the loss of so many officers during the Somme campaign, Herbert was posted to the 8th King’s Own Royal Lancaster Regiment as a Second Lieutenant. His first action was at the Battle of the Ancre in November 1916, and Herbert describes being under fire, trench conditions, and trench life in general. He was appointed battalion bombing officer and spent much of his time instructing troops in the use of the mills bomb. It was during such a demonstration in February 1917 that Herbert was wounded, a prematurely-exploding grenade causing severe damage to his arm. Proceeding to Etaples before later being sent back to Britain, Herbert spent nine months in hospital before returning to duty shortly before the Armistice. The diary, whilst short, is very descriptive and gives a useful insight into many of the roles that were played during the war. Many interesting areas are covered, including discipline, deserters, aerial combat, wiring parties, railway repairs, and the evacuation process for wounded troops. Whilst the diary has been edited by Herbert’s son, it is unclear what this entailed, apart from a short summary of Herbert’s post-war life and a couple of comments in the text. Herbert mentions a great many people by name and it would have been interesting to have some insight into the fate of these men. Some cross-referencing with the battalion war diary would also have been beneficial. 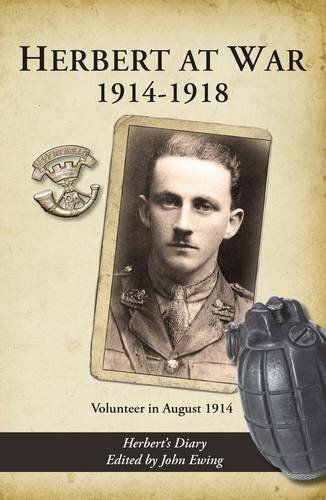 Yet overall the diary provides another first-hand account of aspects of the war and will particularly appeal to those with an interest in the battalions in which Herbert served.